Popular children’s program “Sesame Street” is celebrating its 39th year on the air with a move into Internet media, a Reuters article reports. The public television show, which debuted in 1969, is broadcast in 140 countries, and now will also be available on Hulu, YouTube, and via the iTunes Music Store, according to Sesame Workshop (fka the Children’s Television Workshop). Clips are free on YouTube and Hulu. At Apple’s iTunes store, people can download full episodes from the past four seasons for $1.99 apiece. iTunes already features some Sesame Street programing, such as “Happy Healthy Ready for School” featuring (my least favorite Muppet) Elmo. You can read more about Sesame Street’s free video podcast here. 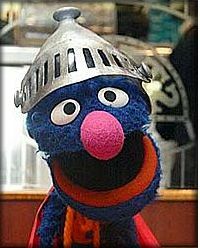 YouTube’s Sesame Street channel already has more than 100 clips from the show, including favorites like Grover the waiter. Hulu will feature 100 Sesame Street segments and 30 other segments featuring celebrity guests such as Norah Jones, Johnny Cash and Patrick “Melancholy Dane” Stewart. P.S.Â Sesame Street must be in the zeitgeist this week. This week, I’ve been listening to a wicked mash-up of Muppet Show / Sesame Street songs on an older episode of DJ Deedle’s Deedlecast. Very catchy. Or maybe adults of a certain age are suckers for anything to do with Kermit and Fozzie and Grover. I dunno.